After graduating from Y Combinator, Crowdtilt launched in February of last year to become “the Kickstarter for any group.” More specifically, the startup has been on a mission to become the platform of record for all manners of group fundraising — anything that isn’t a good fit for crowdfunding platforms like Indiegogo and Kickstarter, for example. 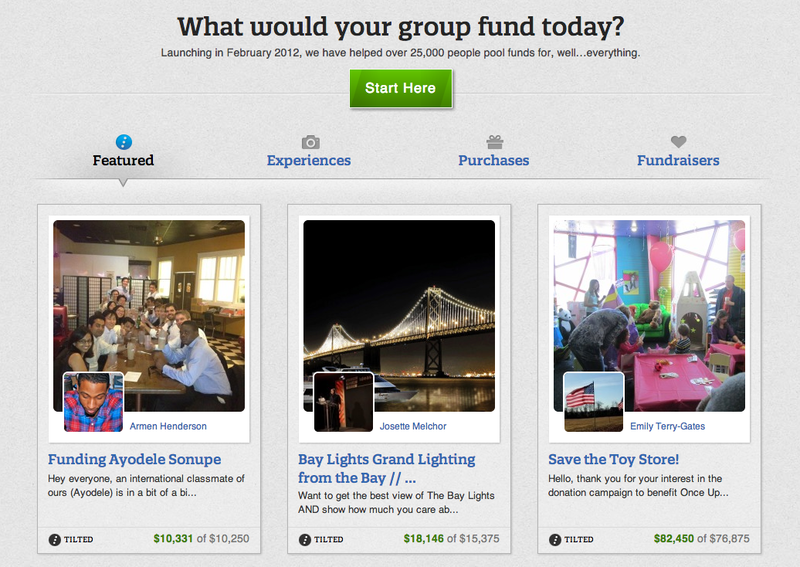 Today, TechCrunch has learned from sources that Crowdtilt has raised $12 million in Series A financing. It’s the startup’s second round of funding, following its $2.1 million seed round back in May, which it raised from SV Angel, CrunchFund*, Y Combinator partners Paul Buchheit, Alexis Ohanian, Harj Taggar and Garry Tan, and DCM and Felicis Ventures. It was an impressive roster of investors for being a few months removed from its graduation from Y Combinator, and we’re hearing that the interest has continued, with the startup closing its series A in four days. According to our sources, investors in its Series A include Napster, Plaxo, Causes and Airtime founder Sean Parker, Andreessen Horowitz (rumored to be through General Partner Chris Dixon), Path founder Dave Morin as well as existing investors like YC’s partners, CrunchFund, DCM and Felicis. Our sources also tell us that, with its new funding in tow, Crowdtilt is also now in the process of making an acquisition that will help bring its group fundraising platform to mobile. Although Crowdtilt declined to comment on both its funding and acquisition, we do know that, at this point, mobile is really the biggest missing piece for Crowdtilt. A mobile-focused acquisition would allow the startup to add complementary features to its group funding platform, like bill splitting or gift purchasing and sharing, for example, increasing the platform’s range of functionality and improving the overall user experience. While it’s not yet clear who the acquisition target is, strategically, a product acquisition would make sense for startups/apps like Fiestah or Tixelated. Both would allow Crowdtilt to add further mobile event planning capabilities to its platform, which itself sees a fair share of fundraising campaigns around events and parties. This would be especially true for Fiestah, considering the two startups have already entered into a partnership to do just that. Our sources indicate that, rather than an acquisition to add single new features like bill splitting, Crowdtilt is interested in picking up mobile talent to make the larger push into developing a Crowdtilt mobile platform. To that end, there are other, more fundamental ways that Crowdtilt could make its business mobile. In January, it released a desktop product called a href=”http://www.crowdhoster.com/”>CrowdHoster to help anyone launch their own custom crowdfunding site “without having to touch a line of code.” The team based the backbone of its code on SelfStarter, an open source project developed by fellow YC alum, Lockitron, to help people build their own ad-hoc crowdfunding site. 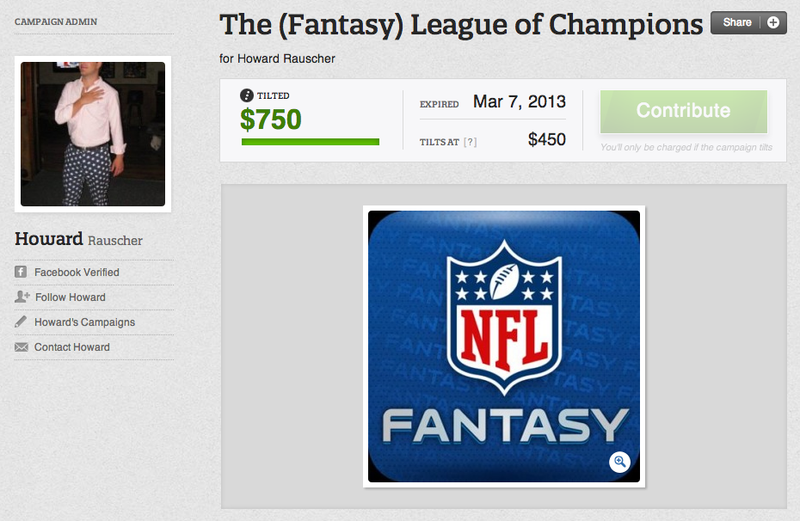 It seems logical that CrowdHoster should also eventually go mobile. Lockitron could be interesting to Crowdtilt for other reasons, too: SelfStarter is not Lockitron’s core business. It built the platform to help launch and own mobile hardware project for a smartphone-operated lock, after it was rejected from Kickstarter. But Lockitron’s mobile knowledge combined with clear expertise in building crowdfunding platforms seems like the kind of mobile talent that Crowdtilt might also be eyeing up. Crowdtilt API evangelist Marc St. Raymond said on Hacker News that the startup was looking to experiment with payment flow and “different shipping scenarios.” Lockitron could hold the key to that. In the big picture, this is all a demonstration of how quickly Crowdtilt has grown. In just under a year, its spin on group-fundraising has found steady adoption. Although Crowdtilt has yet to share statistics in 2013, users raised $1 million across campaigns in its first three months, with the average campaign raising 188 percent of its proposed goal, according to our numbers from December. Since then, Crowdtilt has opened its doors to non-profits and launched an API to give developers access to its group payments and social fundraising. The next step is mobile, and investors like Sean Parker — no stranger to crowdfunding, having co-founded online fundraising platform, Causes.com — could help give Crowdtilt a leg up in an increasingly crowded market. *Standard disclosure: TechCrunch founder Michael Arrington is a partner at CrunchFund.